18 Gauge Pure Solid Copper, ensures a lifetime of durability. The Sinkology Breeze is the worlds only true Silicone non-scratch scrubber designed to resit odors. This patented Scrubber is lightly lavender scented, and comes with a 3-month no order warranty. By gently scrubbing your copper sinks problem areas, the Breeze easily removes food particles and stubborn gunk. By gently scrubbing your copper sink in small areas you will notice the patina fading. 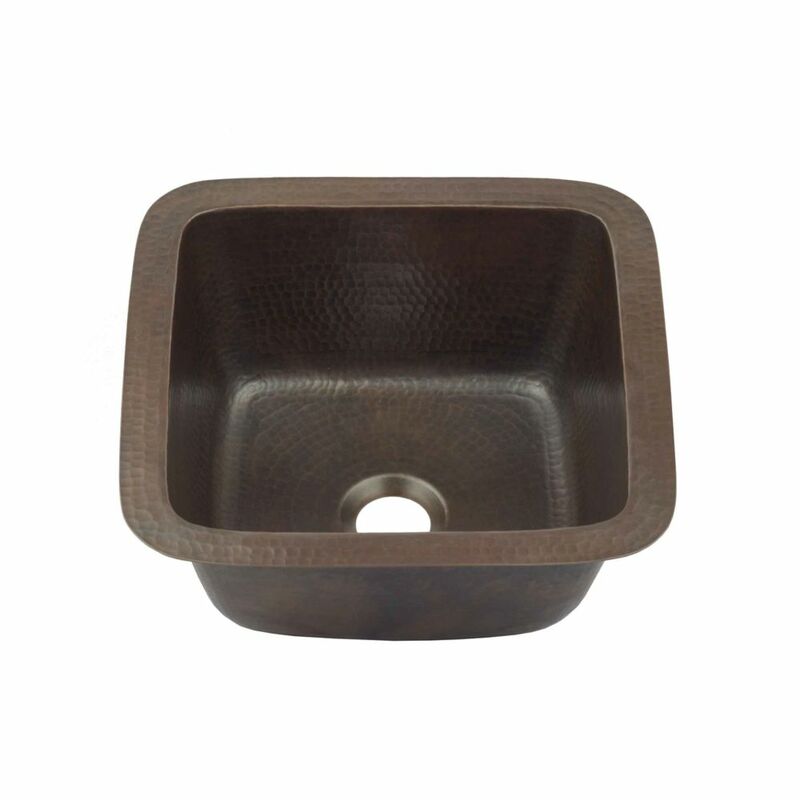 By gently fading problem areas in your copper sink, you are allowing the natural patina process to happen quicker and more evenly. The Breeze scrubber is also the perfect daily scrubber that can safely remove food particles and gunk from even the most gently dishes and pans. The Greco kitchen sink design kit is an easy to install and beautiful All-in-One package. This affordable kitchen design kit includes a Sinkology Aged copper bar or prep sink, Pfister rustic bronze bar faucet, matching grid drain and a copper armor care kit. Everything you need is included to update your bar or kitchen entertaining area. Ever product included in this all-in-one kit is hand selected by our design team to coordinate beautifully and preform flawlessly. All Sinkology and Pfister products are protected to by a Lifetime Warranty. Pollock Undermount Handmade Pure Solid Copper 12 in. 0-Hole Bar Prep Copper Sink in Aged Copper Sinkology artfully handcrafts each copper sink from pure solid copper. With hassle free installation and effortless care, a copper sink from Sinkology is designed to fit your lifestyle and be a focal point of pride for your home. This true work of art comes with a limited lifetime warranty. Pollock Undermount Handmade Pure Solid Copper 12 in. 0-Hole Bar Prep Copper Sink in Aged Copper is rated 4.8 out of 5 by 14. Rated 5 out of 5 by DBB from Perfect little sink for coffee bar. ... Perfect little sink for coffee bar. Rated 5 out of 5 by Todd from Lovely Sink Sink looks great under mounted on custom maple butcher block bar top. If using a bathroom faucet be aware that most included drains come set for overflow drains and will not be compatible with this sink. you will need to install a non-overflow drain. The sink is perfect size for small wet bar. Rated 4 out of 5 by Cjsand from Great bar sink Love it. Wish it was a little deeper but no real complaints. Perfect for our new bar. Rated 5 out of 5 by HaymarketMike from Beautiful sink The sink was installed by my granite contractor without any problems and looks great. After installation, decided I should have purchased next size larger sink, it would look even better. Rated 4 out of 5 by RandomHomeDepotShopper from Does not come with a drain. In the specs/datasheet, it has a drain pictured, but when I received it, there was no drain. These can be pretty spendy $10 - 30 bucks. Anyway, it is a beautiful sink. You wont be disappointed. Rated 5 out of 5 by Kara from Gorgeous bar sink This small bar sink is gorgeous!! !the hammered sink is unique and a statement piece to add to any bar. We were planning on using it as an hnder mount but the lip around the sink is so pretty we decided to mount it on top. Lots of compliments on it. Rated 5 out of 5 by pswan from looks great! beautiful little sink, perfect for small bar area.